Carbon Design Innovations' (C|D|I) carbon core high-resolution probes (CCHR) atomic force microscopy (AFM) start with a core carbon nanotube (CNT) that is then further processed and stabilized with patented technology resulting in a CNT probe with maximum resolution, imaging lifetime and stability. The CCHR high-resolution CNT AFM probes are designed for detailed imaging in metrology and materials science applications. 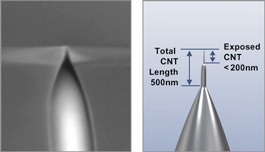 The standard CNT probe length is 500 nm, with the exposed CNT tip <200 nm. 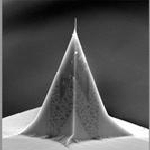 Carbon Nanotube (CNT) probes can offer more robust material properties than traditional silicon probes. CNT probes are not brittle and do not wear down as rapidly as silicon probes allowing for greater than 10X longer imaging lifetime. CCHR probes have true multiwalled carbon nanotubes (MWCNTs), securely mounted, perfectly straight, and normal to the imaging surface. C|D|I uses MWCNTs for its probes to ensure the probe is extremely tough. C|D|I proprietary processes securely attach the CNT to the cantilever and re-enforce the base attachment to ensure the CNT is securely mounted. C|D|I technology allows the manufacture of probes with all the advantages of a CNT tip and the stability and familiarity of a silicon cantilever.